The JohnWesleyProject.com is based on a firm belief in the relevance of John Wesley's teachings and theology for today. The primary goal of this project is to bring the man described as "a plain man for plain people" to as many plain people as possible, using the tools which God in His grace provides us with in the 21st century. John Wesley,who described himself as 'a man of one book', said: "The world is my parish." This project seeks to use high quality DVD course material, the World Wide Web, Blogging, Facebook and Twitter to reach that congregation. 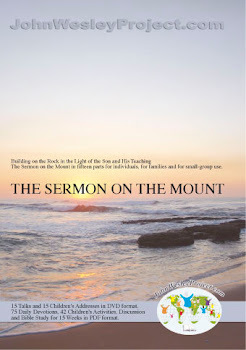 DVD Material based on John Wesley's Discourses on the Sermon on the Mount; Small-group Resources; Daily Devotional;Bible Study Material. An Evening Prayer from John Wesley's Published Prayers 4. I sensed my call into the ministry in March,1976. Fulltime ministry however, was the last thing on my 16 year old mind and I decided to study dentistry and worked in private practice in Pietermaritzburg in South Africa until submitting to the call in 1994. I am a firm believer in the relevance of John Wesley's teachings and theology for the modern/postmodern era that we live in. My goal with this project is to bring the man described as a "Plain man for plain people" to as many plain people as possible. JohnWesleyProject.com. Picture Window theme. Powered by Blogger.